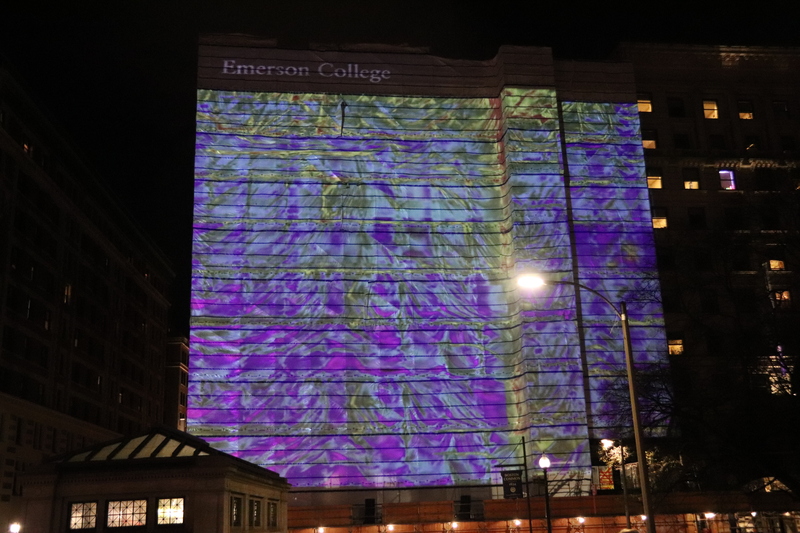 Katherine Chin's Thermograms is featured in Uncommon Project, a large-scale projection mapping showcase that presents the work of faculty, students, and local artists on the Little Building tarp facing Boston Common. Eerie music, a growing crowd, a mysterious countdown projected onto the Little Building—it was almost a dystopian scene on Boston Common Friday night. When the countdown ended, an amplified voice introduced President M. Lee Pelton, who walked across one of LB’s higher floors in the form of a tiny animated silhouette. Uncommon Project is a large-scale projection mapping showcase that presents the work of faculty, students, and local artists on the LB tarp facing Boston Common. The event launched Friday night at 7:30 p.m. with hundreds of students and members of the public in attendance. Joseph Ketner, Emerson’s distinguished curator-in-residence, spearheaded the event. Ketner said he partnered with Emerson Urban Arts, the faculty Public Art Think Tank, and the creators of Boston Illuminus festival to create Emerson's largest ever public art piece. The event uses advanced projectors situated on 172 Tremont and mapping technology to transform LB into a canvas. Uncommon Project was initially scheduled for mid-November, but it was pushed a few weeks because of the Resist Marxism protest on Nov. 18, Ketner said. Friday’s launch included Katherine Chin’s animation Thermograms. Chin, an architect by training, partnered with FLIR, a leader in thermal imaging technology, to use a high-tech cameras to reveal the thermal impact on Little Building throughout the day. Pelton said the Uncommon Project was a success in an interview after the launch. Pelton announced the event in an email Monday. Sophomore Amanda Murphy stood and watched as faraway galaxies flashed across the building. As the images faded away, a pixelated women dancing to slow melodic music materialized on the tarp. “It was more artistic than I expected it to be, but it was still really cool,” Murphy said. The art will come in cycles of six to eight weeks. Ketner said the challenge has been deciding how long each cycle should be to maintain public interest. Each cycle will feature a new set of one to three minute videos made by artists from around the world and curated by Ketner. Along with Uncommon Project, Emerson has created a new spring term course, Partnered Projections on a Large Scale. In the class, which is open to all majors, students will design projection artwork and study the history and theory of projection mapping. According to Ketner, students in this class will have the opportunity to display their artwork on LB at the end of the spring semester.